The internet has decided that today is Green Monday [a good opportunity to recycle things that are not in use or not in need? ], and the Monoprice website is offering 20% off almost everything using coupon code GM2018 [as in Green Monday 2018]. Exclusions and restrictions apply as usual. You can test the coupon by adding the items of interest in your shopping cart and entering the coupon. If there’s another coupon in the shopping cart, you must remove it first. You can test the coupon without logging in or creating a Monoprice account. Coupon code EIGHTH12A gets you 8% off nearly all cameras sold at KEH Camera. Exclusions apply as usual. Their shopping cart is the ultimate decider on what qualifies. You can enter the coupon and see what happens without having to login or create an account with them. Offer ends at 11:59pm ET on Monday. This is a sale without a coupon running until 12/14/18. Borrow Lenses is having a clearance sale on their USED camera gear that is up to 60% off. The price you see is the price you pay. These are gear you purchase for conventional ownership. This promotion is not for camera gear rentals. Friday is upon us and for this day, in the eastern time zone, the KEH Camera offer is a 10% off discount on used gear in EX or EX+ Grade using coupon code FIFTH12A in their shopping cart. “EX” being Excellent. Free 365-day warranty included automatically on purchases made until the end of the year. Free shipping on orders of $49+. Leica products excluded. It pays to be ugly on Thursday at KEH Camera. Coupon code FOURTH12A gets you 20% off on used camera gear in UGLY Grade. The short for this is “UG”. This offer ends Thursday at 11:59pm ET. NOTE that products in “Ugly” condition do NOT get a warranty from KEH. Products from “BGN” (Bargain) up to “LN” (Like New) get a 180-day warranty normally, BUT purchases made until the end of 2018 in the “BGN” to “LN” range get a 365-day warranty instead of 180-day. This happens automatically on the KEH backend based on the purchase date, there is no coupon to enter for this promotion. PS: you can typically tell the ranking of conditions by the prices. For example, “LN” is priced higher than “BGN” which itself is priced higher than AS IS. KEH Camera is running a “12 Days of Deals” promotion, and for Wednesday 12/5/18, coupon code THIRD12A gets you free ground shipping on ALL purchases, no minimum purchase required. Excludes Leica products and anything in NEW or “Like New” condition. Best suited if you are buying small things (chargers, adapters, lens accessories, etc) since KEH Camera typically requires a $49+ order for free shipping. Amazon Germany is currently running a new promotion until February 28 in 2019. IF you are a NEW USER of the Amazon app (first time to sign into an Amazon app using your particular Amazon account), AND you make a 25+ euro purchase, then you will receive a 10 euro promotional store credit in your Amazon account. I’m not 100% certain based on the computer-translation but it looks like the 10 promotional credit will be applied to the first 25+ euro eligible purchase you make after activating the offer. Only products sold and shipped by Amazon itself, in new condition are eligible. Books of all kinds and digital content appear to be excluded. Hello REI commune/hippies! Until 12/2/18, coupon code 25OUTLET gets you 25% off a single item at the REI Outlet store, formerly the REI Garage. Six degrees of separation from photography, especially the outdoors kind. Terms/conditions/restrictions as usual apply. The National Geographic store Cyber Monday sale has been extended until Tuesday night. No coupon code to enter ~ the price you see is the price you pay. Since this is a fixed amount and not a percentage, you can optimize the savings by staying close to the three threshold amounts. Optionally they offer 6-month financing through AFFIRM. B&H Photo has launched their Cyber Monday sales, which you can browse in ever-scrolling fashion or jump into the categories which further offer options for sub-categories. Black Friday Woot-OFF has began! The promised Black Friday Woot-OFF has began at the Clearance/Sellout sub-Woot. 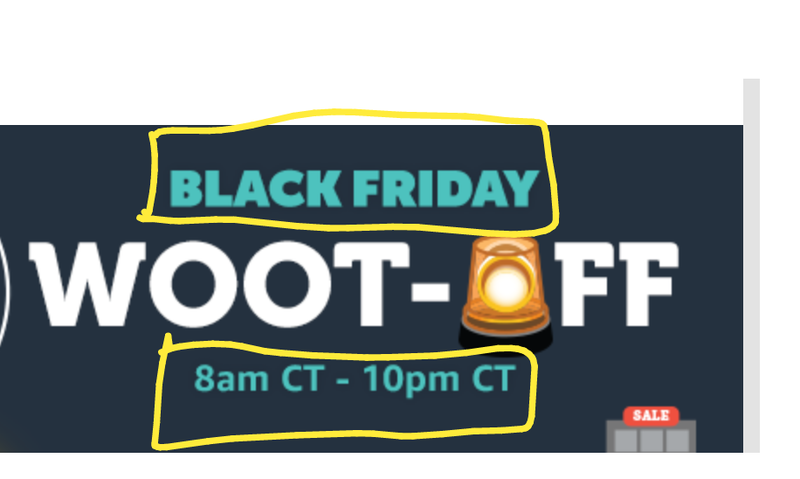 The official run time of this BF Woot-off is 8am to 10pm central time. The usual terms apply, items change/rotate and you pay a flat shipping fee for everything you buy during the calendar day. If you are a Prime member, and login with your Prime Amazon account, you get free shipping on most things. The only things that don’t get free shipping are items that are shipped outside the Woot/Amazon ecosystem, such as Shirts and Gourment. But even so, some of the Shirts/Gourmet items may have free shipping on their own on occasion. Which brings us to the numerous Best Buy Black Friday offers. Their B&M stores are open until 1am local time on Friday (from the Thursday opening), and open properly on Black Friday actual between 8am and 10pm local time. Some local/regional stores may have different schedules so check before going if you are not certain. Amazon Germany has launched their own Black Friday specials, and they are using a slightly different approach than the Amazon USA mothership. For example, the Germany Gold Box will have new offers every five minutes. If you prefer a different view of the offers, this is their other Gold Box view. Don’t forget they are also running their two-parter promotion, spend $100+ by 12/2, get a coupon for $25 off $50+ to spend on 12/5 through 12/31/18. Restrictions and limitations apply – check their website for details. Groupon too has launched their Black Friday sales including some action on the instant cameras and action camera fronts along with technology, goods, photo print offers [under LOCAL deals] and more! They also have their own deals of the day. B&H Photo has just launched their Black Friday deals. Check the various categories and sub-categories for products and subjects of interest. More details on these later today! I haven’t mentioned this yet this year, so it’s a good time to mention it 🙂 Good until 12/31/18, KEH Camera is doubling their warranty from their usual 180 days to 365 days. This is a pretty good warranty duration for a USED product, in many times matching a new condition product. And KEH is a reliable place for fixing cameras to boot. I don’t remember when this promotion began for the 2018 holiday shopping season. If you made a purchase before today that happened during the 365-day warranty window, you automatically get the 365-day warranty. For a limited time, coupon code BF20 get you 20% off near site-wide at the Rakuten website. Note that, as always, restrictions and exclusions apply to the use of the coupon. Check their website for details. Not to be left behind by the ever-earlier Black Friday launches, the Monoprice website too launched their own Black Friday sale with 270+ products featured in said sale. Speaking of Monoprice, their brand new line of AtlasFLEX charging cables (USB-C, microUSB, Lightning) are now shipping and they have free US shipping for a limited time. They range from $4 to $8. Stacksocial has gone into Black Friday mode with a trio of limited time coupons! All apologies but I don’t have my Best Buy account on this laptop, and I cannot remember my password, so I can’t see what’s on sale. But if you are a member of the Best Buy Rewards programs [free to join], and you are logged on to your BB rewards account, they are currently running an Early Access sale. After that, the sale [or whatever is left] will open up to everybody else. 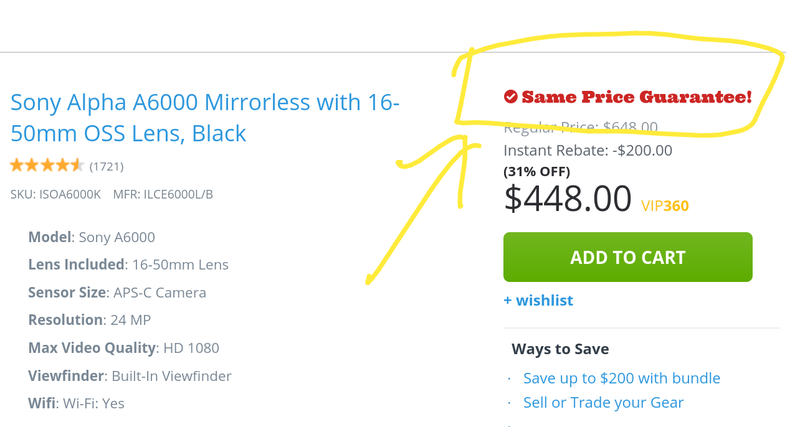 Best Buy has been using this online strategy lately. The more you spend in a year, the higher the reward level you reach, and the earlier you see the offers. If you are a pleb like me, you are at the entry-level reward level so you are the last to see the offers before the general population does. + GoPRO HERO 7 bundles featuring the Black and Silver models; remember, with GoPRO a different color is a different model; not just a different color! Adorama is currently running their Black Friday Preview sale featuring over 2800 products which you can filter further down using the left hand side of their website (eg by brand or product type or price-range and so on).